UASC-1 offers musicians, DJ's and producers a mobile monitoring studio solution that satisfies the requirements of both analog and digital audio applications. 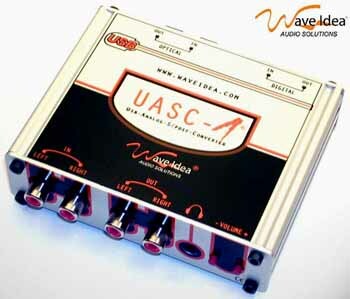 Once connected to the USB port of a Mac, PC or Notebook, UASC-1 delivers to the user a 48 kHz at 96 dB Signal to Noise Ratio. No driver, no IRQ, no DMA configuration is required when using UASC-1 in this simple application, simply plug and play high audio quality with absolutely no configuration. I'm looking for a USB Audio interface, that can be easily connected to my computer, in order to listen my favorite CD, DVD and MP3. Does UASC-1 answer to my needs ? What can I do with digital and optical inputs and outputs since I don't own any studio equipment ? Is UASC-1 compatible with my USB computer port? I create music with my computer, using soft synth such as Reason, Reaktor, Rebirth, Fruity loops, ... Is UASC-1 compatible with these soft ? Is UASC-1 able to fully exploit these enhanced soft ? I have a Mac OS-X, do I need an ASIO driver to reach low latency ? I'm a confirmed musician, I own a computer and hardware gears (synth, sampler, ...), is UASC-1 interesting for my professional application ?